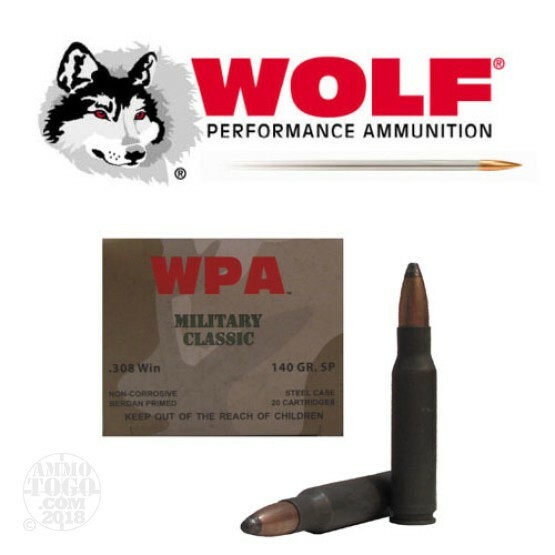 This is .308 Wolf Performance Ammunition Military Classic 140gr. Soft Point Ammo. This ammo has a polymer steel case and is 100% non-corrosive, berdan primed. Economically priced ammunition for high volume shooting. Designed for reliable ignition and functioning in adverse conditions. Polymer coating ensures smooth feeding and extraction. This ammo is packed in 20rd. boxes, 500rds. per case.